Mang Wang and co-workers from Northeast Normal University have reported in Organic Letters on a ring opening reaction of siloxy difluorocyclopropane to access difluorocyclopentenones. Guangbin Dong and colleague have reported in JACS on an intramolecular coupling between cyclobutanones and allenes. Javier Read de Alaniz and co-workers from UCSB have reported in Tetrahedron Letters on the synthesis of cyclopentenones from furans through a Piancatelli rearrangement. Grubbs and colleagues have reported in JACS on their studies with asymmetric ring closing metathesis. Guangbin Dong and colleague at UT Austin have reported in ACIE on the synthesis of cycloinumakiol through a rhodium catalyzed cascade reaction that forms the tetracyclic ring structure of the compound. Jin Kun Cha and co-workers at Wayne State University have reported in ACIE on a ring opening of cyclopropanol using stoichiometric diethyl zinc. Alexander Butin and co-workers at Kuban State Technological University in the Russian Federation have reported in Tetrahedron on a tin mediated furan ring opening reaction. 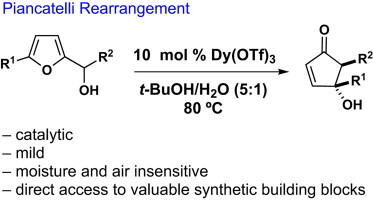 Shigefumi Kuwahara and co-workers from Tohoku University have reported in Tetrahedron Letters on the synthesis of rumphellaone A. They accessed the four membered ring from a base promoted intramolecular epoxide ring opening. Philip Fuchs and co-workers at Purdue University have reported in Organic Letters on their progress towards aplyronine A. They used a seven membered ring with four stereocenters as a precursor to the C1-C20 fragment.